Over the last few weeks people like you, from all walks of life issued a wake up call to the world: women’s health comes before political and corporate agendas. If we’re taking a serious look at the motives behind breast cancer fundraising let’s be honest: pink ribbon vodka and pink buckets of fried chicken won’t end this epidemic. And, every time a company slaps a pink ribbon on a product that increases our risk of breast cancer, corporate profits come before women’s health. Contributing to and then profiting from a disease that kills 40,000 women a year is wrong and it’s time we put an end to it! Your willingness to take action and step up when you are most needed has inspired us to create a Think Before You Pink® Toolkit. Our new Think Before You Pink Toolkit is a direct response to the unending parade of pink ribbon paraphernalia that does more harm than good. Wake up the world. Download your free copy of the Think Before You Pink Toolkit. ask questions to be certain your donation dollars go towards addressing and ending this epidemic. Action speaks louder than pink. Download your free copy of the Think Before You Pink Toolkit. Last week thousands of us rallied together to challenge Komen’s decision to defund Planned Parenthood for one simple reason: women’s health should ALWAYS come before corporate or political interests. Far too often, political and corporate agendas trump what’s best for women’s health. We see it in pink ribbon marketing, toxic chemical (de)regulation, human gene patenting. No more. Take a stand with us to say: we will not allow political and corporate agendas to continue to hijack women’s health. 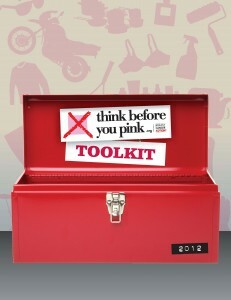 Download the Think Before You Pink Toolkit and put the tools of change in your hands. Thanks for all you do for women’s health. Together, our actions will always speak louder than pink.